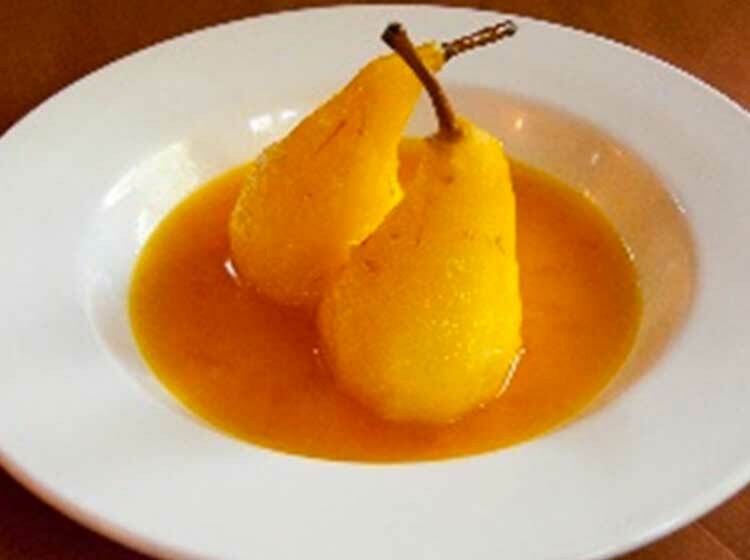 Plump, juicy pears, bathed in a pool of golden saffron syrup, spiced with cinnamon and star anise, make a dream dessert for any dinner party. Saffron evokes romance and rarity always elevates an ordinary dish to a gourmet status. There are many different variety of pears and they are in season from July to early Spring. Choose ripe, but firm pears with an unblemished skin. Peel the pears without removing the stems. Carefully core them with an apple corer. Slice off the bottom of each pear in order to make them sit straight. Place the saffron in a heavy based saucepan and add the water, sugar, cinnamon and star anise. Bring it to the boil and add the pears. Reduce the heat to low, cover and simmer for 10 minutes until the pears are tender, but still firm. Carefully remove the pears and reduce the syrup to half its original volume. Pour over the cooked pears and serve on its own or with whipped cream, crème fraiche etc.